Finally! A webinar for comedians with professional careers! Do you have a full-time job, life and family responsibilities? Is it difficult to get quality stage time? Has your stand-up comedy career stagnated? You need Super Funny Stand-up Comedy! 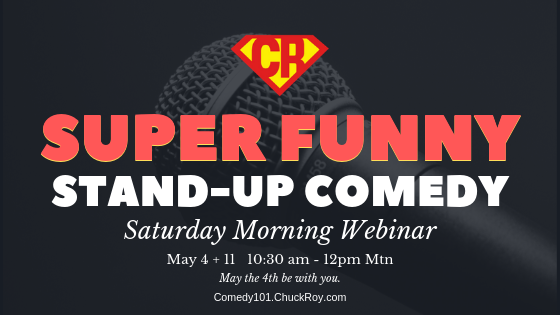 Chuck Roy’s created an online workshop to help you achieve your stand-up comedy goals! Work with professional comedians to improve your jokes and performances! Network with comics to connect with better gigs and stage time! Please, click here to purchase access to the Comedy101 Super Funny webinar. Create super funny jokes and material. Write and collaborate with Chuck Roy. Get feedback and tips from professional comedians. Purchase access to the Comedy101 Super Funny webinar.